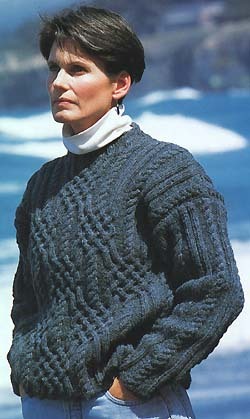 This pullover is knit using Jamieson's Heather Aran 100% wool yarn and is from Jamieson's Shetland Knitting Book 3. Yarn kits for 2 sizes for adults are detailed below. The pattern calls for 57 gram (2 ounce) skeins of "Soft Shetland" which is now called Heather Aran and is packaged in 50 gram balls. The number of balls required has been adjusted to compensate for this.